This is a luxury private residence, ocean front property locally known as Harmony Condominium's. Centrally located in the middle of the prestigious Cabarete bay, this stunning, well decorated unit offers 3+ bedrooms, 3 baths, full kitchen, living room, den with sofa sleeper, dining room, laundry room ,walk out terrace, private infinity pool and gated 24hour security. This ground floor property is 2,700 sq feet (257 sq meters), fully air conditioned and can easily accommodate up to 8 guests. Within a short one block walk you will find Cabarete’s shops, markets, bars and restaurants. 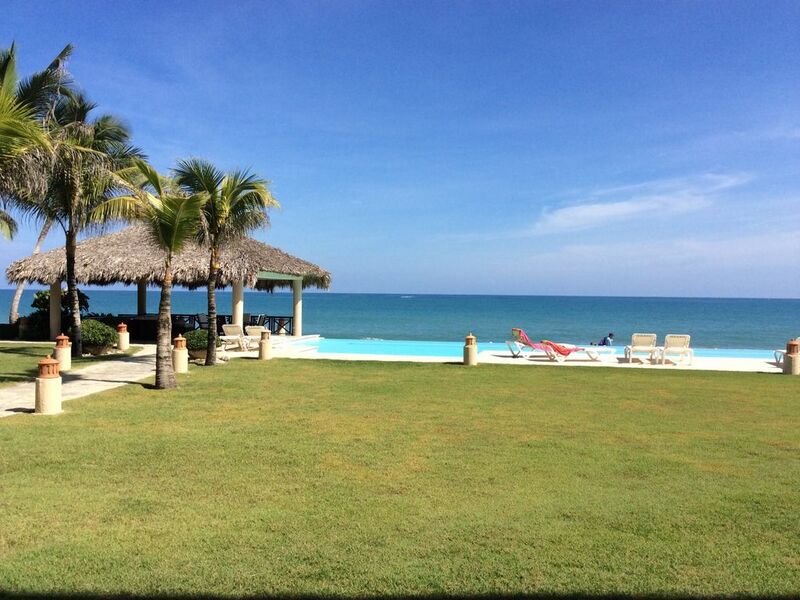 All these amenities make Harmony Condominium’s of Cabarete truly a luxury vacation destination. The Living room is designed for your total comfort! Furnished with fine Italian leather designer furniture and custom made natural stone tables, this warm and luxurious room will make you feel at home. While relaxing with family and friends you can enjoy watching cable TV or a DVD on the 42” flat screen plasma TV, connect to the wireless WiFi internet, listen to MP3’s or the radio. Two large sliding glass doors open to the terrace with a spectacular front row view of the infinity pool and ocean. Master Bedroom One has a 4 poster King Size Bed with top of the line Beauty Rest mattress, 600 count sheets and a Duvet with a down filled comforter. Not only does this room have a large window which allows you to wake up to a spectacular view of the ocean and infinity pool, the room has it’s own private bath including a large walk in shower, whirlpool tub, double sinks, and two large mirrored closets which also contain a safe for your personal valuables. Bedroom Two has a 4 poster King Size Bed with top of the line Beauty Rest mattress, 600 count sheets and a Duvet with a down filled comforter. This room has a large window which allows you to wake up to the stunning view of the ocean and the infinity pool just as Master Bedroom One. This Bedroom also has its own private bath and a large closet which contains a safe for your personal valuables. The Family Room / Den not only provides a great media room with Mahogany/Glass French doors for privacy, it also has a 27”flat screen TV with Cable and DVD. A Queen Sleeper Sofa in this warm and inviting room, folds out, providing more sleeping quarters if needed. This sleeper sofa has a memory foam topper and top of the line bedding for additional comfort. This FULLY equipped kitchen has all stainless steel appliances and granite counter tops. If you feel like dining in, this kitchen has everything needed to prepare any kind of meal. The dining room is furnished with a full size custom made round wood table and six white leather chairs. The ground floor terrace opens up to a professionally manicured lawn and gardens while offering front row views of the pool and ocean. Watch your kids play, take in the kitesurfing / windsurfing action or simply enjoy spectacular sunsets from the comfort of your private terrace. Individual controls for every room. 3 Bedrooms 3 Bathrooms Master Bedroom has King size Beauty Rest Matress 600 count sheets private bath with whirlpool tub. Bedroom #2 has a King size Beauty Rest matress with 600 count sheets and private bath, Bedroom 3 has (2) Full size beds with 600 count sheets, Den with Queen Sleeper sofa, Ocean view, Beachfront, Ground Floor, Private Infinity Pool, Fully Air Conditioned, In room Safes for valuables, 42” flat screen plasma TV, 27”flat screen TV, Cable TV (English and Spanish), DVD / MP3 player, Radio, WIFI Internet, Full Size Washer and Dryer, Fully Equipped Kitchen, Stove / Oven, Dishwasher, Microwave, Coffee Maker, Toaster, Blender, 24/7 Security Staff, Towels, Beach towels provided, Linens provided, No Smoking, No Pets. After researching places to vacation in the Caribbean, we took a risk and chose a place we had never been to before: Cabarete. With positive past experiences with VRBO, we chose this condo. We couldn't have been more pleased! It was wonderful...clean, fully equipped and just like the photos: gorgeous, with the most comfortable sleeping accommodations! The location was excellent: right on the beach overlooking the pool, gound floor, a great outdoor patio with beautiful views. It was so convenient to all of the outdoor restaurants 5 minutes down the beach. Cabarete was so enjoyable. This is not a destination with all-inclusives, and high-rise hotels. No chain restaurants...but instead has lovely quaint little condo resort properties and charming little tropical restaurants of every type of cuisine. We took two college girls with us for their spring break... Not your typical spring break environment...but they said it was their best spring break ever! Lots of adventure trips, along with kiteboarding entertainment. The beach was so clean and the waves were fun for all kinds of water activities. We loved our week in this Harmony condo. Owner Tom was so helpful to answer all of my questions before we committed. Thank you Tom, you were right, we loved it! We stayed here in early December and it was amazing. The condo was perfect for the 4 of us. It was a short 10 minute walk on the beach to great restaraunts as well. The area has a Security Guard which made you feel safe. We rented a car and took in some Golf in the area. Windsurfers paradise but we didn't have any wind this week. We were starting to believe that once you have been to Cabarete... you come back and stay forever. Kiteboarding and Windsurfing are two of the most exciting water sports in the world. Cabarete provides ideal conditions to learn or perfect your riding skills with its wide soft sandy beaches, warm water and steady trade winds. Several kite and windsurfing schools are located right on the beach and provide all levels of instruction from beginner to advanced.